The 2018 Photo Contest consisted of four different categories and four cash prizes. The categories were: Most Likes, Popular Vote, ECMA's Marketing Choice, and two Random Submissions. While the cash prizes ranged from 5,000-10,000 yen. We had over 600 amazing submissions, each posted on social media with the hashtag #COO18. The following are the photos that stood out the most. Congratulations to our astounding winners. 🎉 Stay tuned for next years contest! The Popular Vote category was exactly that. ECMA created a poll that displayed 25 submissions and allowed all of the interns to vote, as well as friends and family members. Out of the 25, this photo received 18% of 235 votes! It won by a landslide! The winner of this category is Jim Huang. Here is Jim creatively using the Tōrii gate in his prize winning photo. 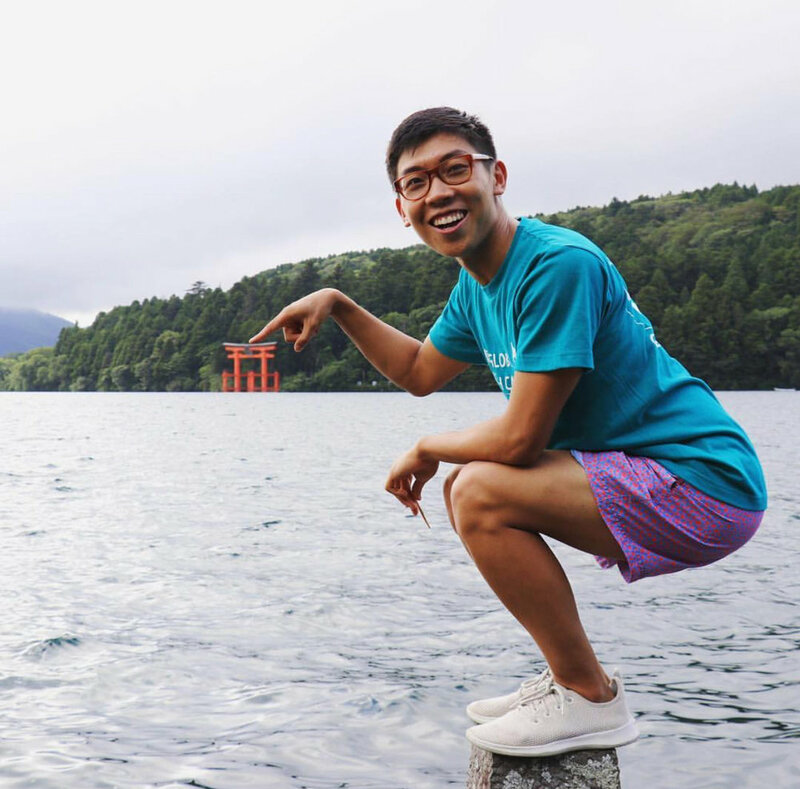 Jim is a Yale ‘18 graduate whose obsession with food and travel has driven him to spend the summer in Japan. Even more than eating and sightseeing, however, Jim has also enjoyed meeting some quality people in and out of the English Camp classroom. He hopes to have similarly positive experiences in many more countries in the future. The Most Likes category was a close call with over six hundred submissions and thousands of likes given in total. Amy Saslekova won with a whopping 435 likes on her "Japan Rocks! Hahaha" Instagram post. A perfect caption for a photo that displays her sitting on Japanese Rocks (hahaha). Amy is a University of Michigan senior who enjoys traveling, volunteering, exploring new restaurants, drinking coffee, and taking photos. She speaks four languages and hopes to learn many more! Amy’s having a blast exploring Japan and is eating her way through the best food in the country. ECMA's Marketing choice was such a difficult choice because there were so many amazing photos submitted, but this particular photo really stood out to all of us. We felt like not only was it visually appealing, but it really represented Come On Out. It accurately exhibits what we want our interns to do, immerse themselves in a culture different from their own. To come and teach isn't the only part of working with us. We want to spread culture, diversity, and give our interns an experience of a lifetime. The winner for this category is Franca park. 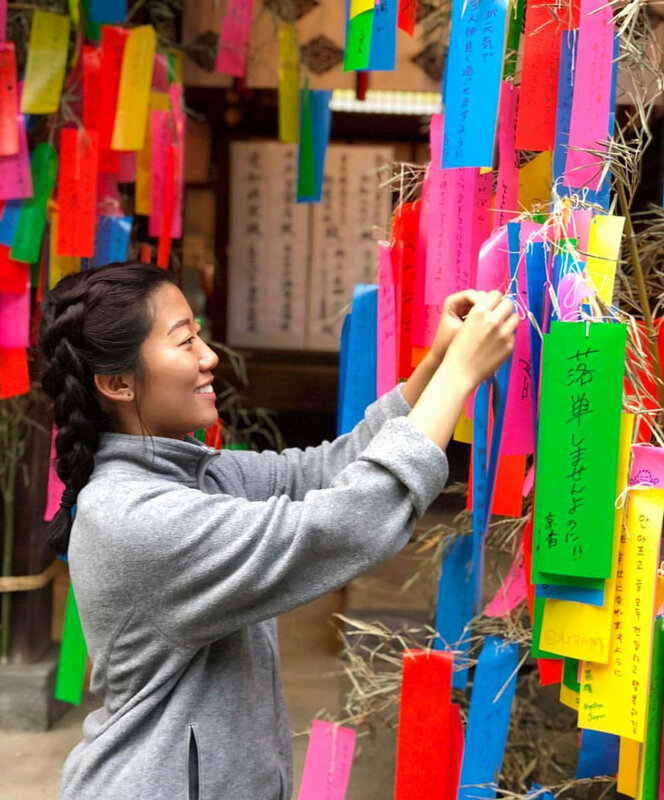 Here she is hanging up one of her wishes in Kawagoe. Franca is a 4th year UCLA studying Psychobiology. Although she aims to attend Physician Assistant School with goals of decreasing healthcare disparities, she loves art, attending music festivals, and fashion. Her favorite part of Come On Out Japan was meeting so many amazing people! Although random, the two submissions that won this category were clearly deserving. The first winner is Jimmy Zhang. Jimmy posted a picture of himself posing in front of the ocean in Matsushima, Miyagi during golden hour. Jimmy is a Stanford '18 graduate who enjoys eating food, watching random YouTube videos and rewatching TV shows and movies, spending time with family and friends, and perhaps most of all, traveling. He loves the food, traditions, people, and sights in Japan and has had a great summer here! The Second winner is Kimberly Aguilar, also known as Kim. Kims picture is of her and her housemates exploring Japan and taking pictures with stuffed bunnies. Kim is a 2018 UCLA graduate that loves to teach English. She hopes to help both the Latinx and Deaf communities through social work.